A pirate show is fun for any party, event or pirate theme party. Pirates for Parties will provide you with the finest pirate entertainers and plan and produce a pirate show for your event. A pirate show is full of high seas drama, comedy and barrels of swashbuckling sword fighting. 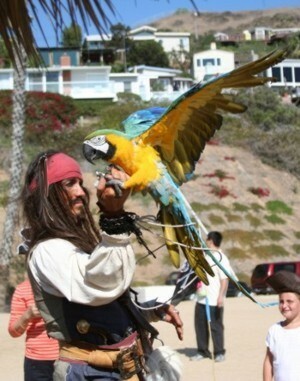 We also have parrot shows , and we offer America's largest troupe of performing parrots for your entertainment . We have Captain Parrot Jack and his parrots and pirate entertainers and other pirates for hire are available for any kind of event or party. We can also produce the ultimate pirate themed party or corporate event. We specialize in Caribbean themed parties and pirate parties for adults and children's parties. We entertained at many public and private events all over America. Read letters from our clients . San Diego, Rancho Mirage, Indian Wells, Thousand Palms, Moreno Valley, Claremont, Montclair, Riverside, Ontario, Upland, Cucamonga, Redlands, Corona, Las Vegas,and other locations. We also provide service in the states of New York, Illinois, Pennsylvania, New Jersey, Connecticut, Rhode Island, Washington D.C. Maryland, Massachusetts. We will travel anywhere in the USA. Disclaimer: Pirates for parties holds no rights to Disney characters including, but not limited to Captain Jack Sparrow, as well as the title "Pirates of the Caribbean: The Curse of the Black Pearl"or other Disney movie titles and characters are TM and © (or copyright) by Walt Disney, and or Jerry Bruckheimer, Johnny Depp, and his or its related entities. All rights reserved. Any reproduction, duplication or distribution of these materials in any form is prohibited. This web site, its operators and any content on this site relating to "Pirates of the Caribbean: The Curse of the Black Pearl" or any other Disney movies or are not authorized by Walt Disney, Bruckheimer Productions, or any of its related entities. We are not affiliated in any way, nor do we by fact or inference imply to hold any rights or authorization, rights of association or sponsorship or endorsement of the use of any copyrights or trademarks as held by any individuals, or companies mentioned or pictured in association with any offer, including, but not limited to Walt Disney, Jerry Bruckheimer and its related entities. This Web site ant its contents are © copyright 2008 by Pirates for Parties and all rights are reserved. No portion may be copied without express written permission.